Do you ever wonder what the most popular barstool in America is? We didn’t take a scientific poll, but the unofficial answer is the Ladder Back Stool. Why is the ladder back stool so popular? This classic stool blends with any type of home décor. 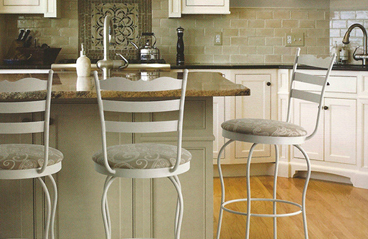 No matter the colors or patterns in your kitchen, the simple lines of the ladder back stool will match. The ladder back stool is strong. Think about a big-bodied handyman standing on the top of a ladder, cleaning out the gutters. That’s the sort of strength you’ll find here. Designs such as Claremont and Louis are made of 16 gauge steel which supports a tremendous amount of weight. Design trends and colors can change a few times a year, but the best pieces are stylish for decades or longer. Ladder back stools and chairs first appeared in the Middle Ages. They became popular in England in the 17th Century, and they’re one of the staples of American Colonial décor. That’s quite the resume! Ladder back stools present a wonderful palette for variation. Without ornamentation, ladder back stools are known as utilitarian, rustic furniture. But if you want something more decorative, ladder back stools can be dressed up in countless ways. 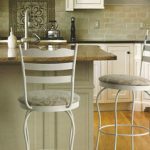 When you browse our stools, you’ll see how many ways you can customize your choice – seat cushion, wood seat finish, metal finish, swivel style and more. What draws you to the ladder back stool? Visit us on Facebook and let us know!